Politics is developing more comedians than radio ever did. 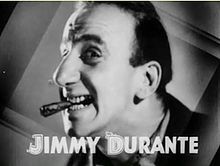 James Francis Durante (10 February 1893 – 29 January 1980) American pianist, actor, comedian, composer, and singer; usually known as Jimmy Durante, also nicknamed "The Schnozzola", and "The Schnoz", in reference to his large nose. Be awful nice to 'em goin' up, because you're gonna meet 'em all comin' down. Everybody wants ta get inta da act! Oh, what a tune for crooning. It's got the whole world spooning. "Inka Dinka Doo" (1933) written with Fred Ryan and Harry Donnelly. Variant: Why can't everybody leave everybody else the hell alone? That's the conditions that prevail! I don't know where it's going, but I'm sticking with it! I was hurt so deep that I made up my mind never to hurt anybody else, no matter what. I never made jokes about anybody's big ears, their stut- terin', or about them bein' off their nut. Goodnight Mrs. Calabash, wherever you are. Be nice to people on your way up, because you're going to meet them all on your way down. Be nice to people goin' up, because you're going to meet them all comin' down. Be nice to 'em goin' up, because you're going to meet them all comin' down.